Hyperthyroidism is one of the most common cat illnesses and is curable in many cases. 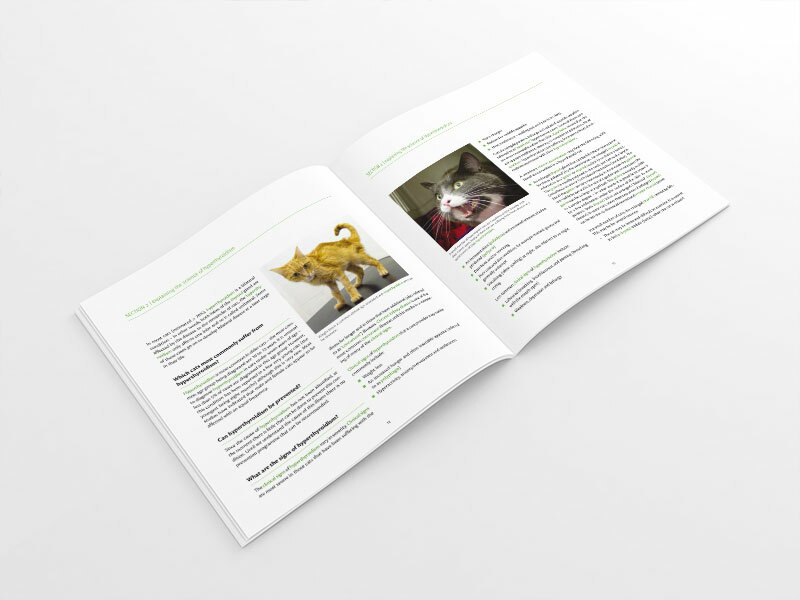 An 88 page fully illustrated book aimed at cat owners and veterinary professionals, launched May 2013. Hyperthyroidism is one of the most common cat illnesses and is curable in many cases. Caring for a cat with hyperthyroidism has been written as an information source and support tool primarily aimed at owners whose cats have been diagnosed with hyperthyroidism. 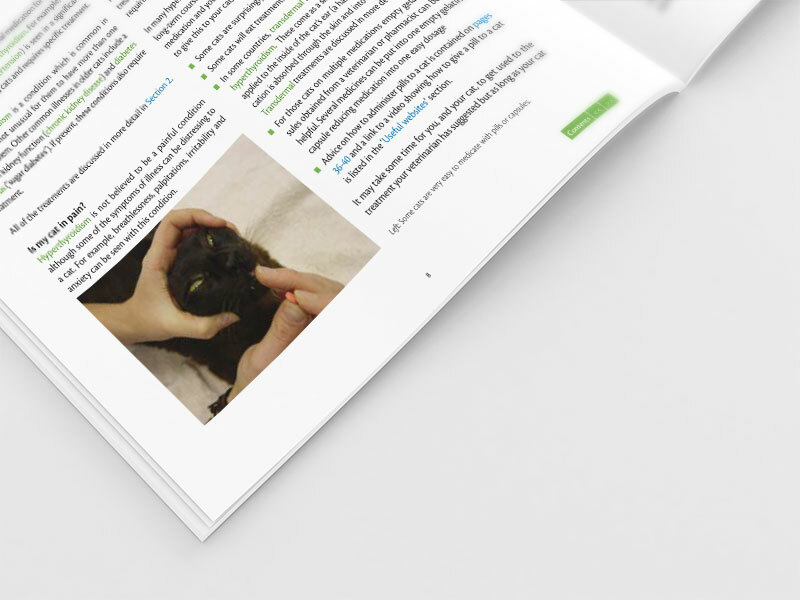 It is designed to be the perfect resource for cat owners but is a useful tool for vet students, veterinary nurses and technicians. The book explains what hyperthyroidism is, how it is diagnosed and what the various treatment options are. The emotional as well as the medical aspects of coping with a cat with hyperthyroidism are discussed with a lot of practical advice on all aspects of care. Caring for a cat with hyperthyroidism contains a detailed glossary of terms commonly used by vets and several case reports illustrating how successful treatment can be. The newly revised second edition contains more information on testing for hyperthyroidism, subclinical hyperthyroidism (what this is and how to diagnose it), the importance of hypothyroidism and how to avoid it and a new section on management of hyperthyroidism using an iodine-restricted food. I would like to take this opportunity to add that I am an avid reader of your ‘Caring for a cat….’ series. These books have been of huge benefit to me and my super senior cat Rufus, none more so than your book on hyperthyroidism following his diagnosis last year. Trying to remember everything you are told in the consulting room when you receive the initial diagnosis is not always easy so having a book on hand to refer to at any time is invaluable. Learning about the advantages or disadvantages of the various treatment options my husband and I were able to make a well informed decision. DVSc DipVetAn MVetClinStud PhD FACVSc FASM, Valentine Charlton Feline Specialist, University of Sydney, Australia. 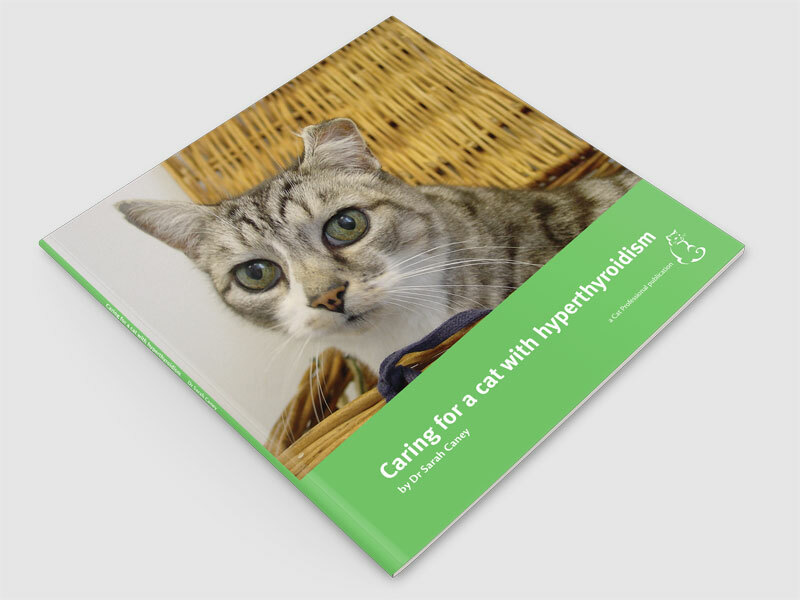 Sarah Caney has produced another fantastic book to help cat owners – this time, for the clients whose cat has been recently diagnosed with hyperthyroidism. The book is written in gentle flowing prose, with information that is almost at the veterinary level in terms of depth of understanding. The information is explained so clearly and expressed so simply that it is within the grasp of the average owner. Sarah explains the pathophysiology of the disease, why cats get clinical signs, and the chronology and progression of the condition. Importantly, she goes through all the different treatment options that are available, discussing the pros and cons of each alternative. This will help enormously - as there really is quiet a choice and the reasons why a vet may recommend one treatment over another can be difficult for a client to perceive. Many vets will take the opportunity of giving this text to owners with recently diagnosed hyperthyroidism, to help them play a more active role in deciding the treatment options for their cat. I cannot recommend this book too highly – owners will get a lot out of it, nurses will learn quite a bit, and even experienced feline clinicians will find out some new ways of thinking about how to treat different individual patients. A brilliantly written book, very well thought through and extremely thorough yet written in a way that owners will easily understand. This book will answer any query that an owner has about hyperthyroidism and greatly deepen owner understanding of the condition. A definite must for any practice that sees feline patients, and highly recommended for any owner of a hyperthyroid cat. Having read Sarah’s book all I can say is how lucky the owner of a newly diagnosed hyperthyroid cat would be to have access to it. I would have given my eye teeth to have had a book like this to read when my first cat was diagnosed, and even though I have learnt quite a lot since (with my little hyperthyroid gang of six), this has made much of what I thought I understood so much clearer. It would have saved me many sleepless nights over the last few years. This book is a must for every vet’s surgery and I will be nagging my practice to get a copy. In fact, I think I will provide them with one as I think it is an absolute necessity. What effect do thyroid hormones have on the body? What is the thyroid gland and what does a healthy thyroid gland do? Which cats most commonly suffer from hyperthyroidism? What are the signs of hyperthyroidism? Are there other illnesses which can mimic hyperthyroidism? What other tests are helpful in cats with hyperthyroidism? What does treatment of a hyperthyroid cat involve? What is the best way to medicate my cat? What is the best treatment for my hyperthyroid cat? Can hyperthyroid cats with chronic kidney disease still receive treatment? Can hyperthyroid cats with diabetes mellitus still receive treatment? What about cats with thyroid carcinomas? How can I give my cat the best quality and length of life possible? Are routine vaccinations and worming still needed in cats with hyperthyroidism? What is the prognosis (long-term outlook) for cats with hyperthyroidism? Sarah qualified as a veterinarian in 1993 and has worked as a feline-only clinician for more than twenty years. 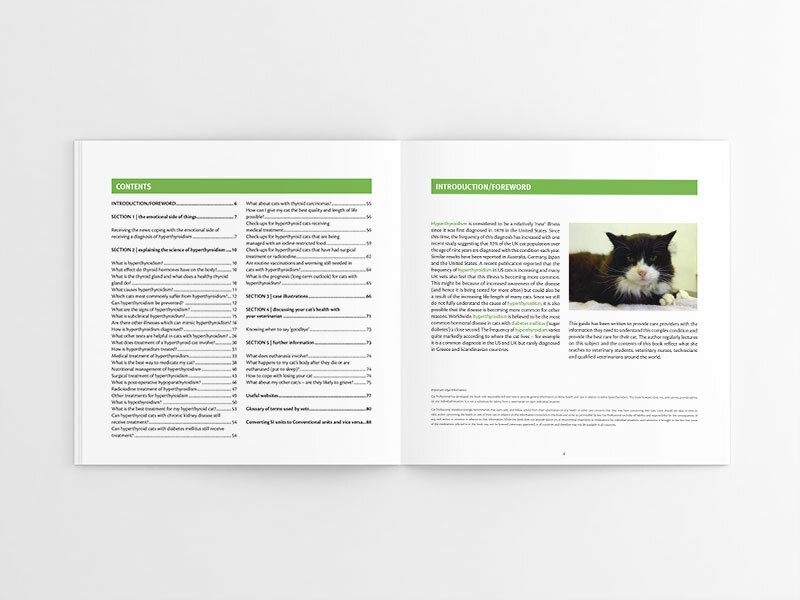 Sarah has authored and co-authored a number of other Vet Professionals publications including ‘Caring for a cat with chronic kidney disease, ‘Caring for a cat with lower urinary tract disease’ and ‘Caring for an elderly cat’. Sarah currently lives in Scotland with her family (including one cat, Sooty) and enjoys seeing both first opinion and referral feline patients. Sarah’s detailed biography can be found here.